Watering is an essential aspect of maintaining a landscape—but not all clients have an irrigation system or the time to keep up with watering by hand. 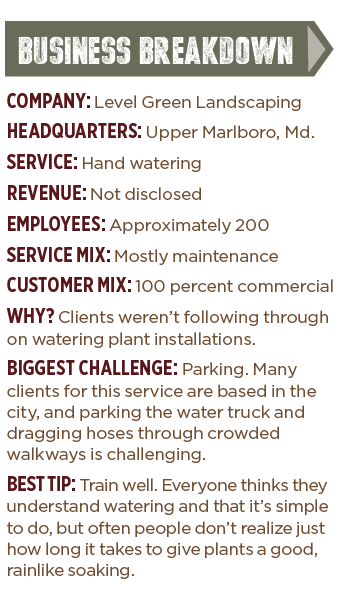 Level Green Landscaping, based in Upper Marlboro, Md., discovered many of the commercial properties it served in the Washington, D.C., area did not have an irrigation system. And rainfall often wasn’t enough for clients with seasonal color installations. That’s why Level Green created a hand watering service. It’s been a profitable upsell that also provides value for commercial clients. About 5 percent of the company’s accounts opt for this service. The company has two ways of billing for watering services, according to Brad Sarno, operations manager. 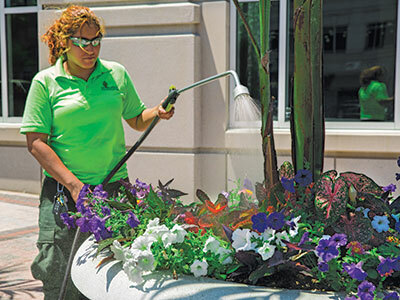 If the client already has a spigot, then the Level Green team arrives on site with hoses and diffusers and handles making the connection and watering. When done this way, Level Green charges an hourly labor rate. If the client doesn’t have a spigot or doesn’t want to use it, Level Green also owns water trucks and tanks that use municipality water. The company charges a premium for this approach. It covers the use and maintenance of equipment and the cost of purchasing water from the municipality, measured by a water meter. Sarno says the company has a good mix of clients who use the water trucks and those who use their own spigots. Of course, some scenarios warrant one over the other. For instance, in the case of a large commercial town center that the company serves, Sarno says it couldn’t be done the right way without a water truck. Level Green also bills clients for travel to their locations. Hand watering crews (typically just one man) are routed by area to create dense routes, which eliminate excessive drive time from job to job. Investing in water trucks is the largest cost associated with this service, Sarno says. A new truck suitable for carrying the required amount of water with a tank likely costs more than $50,000. Another option is to employ a “water wagon”—a tank and pump on a trailer, which would cost about $10,000 and could be pulled behind a heavy-duty pickup truck. One tip Sarno shares for hand watering is to start early. Level Green watering trucks leave by 6:15 a.m. In terms of which clients use this service, Sarno says it’s a variety. The list includes some homeowner associations, universities, office complexes, residential housing complexes and shopping centers. It’s a relatively easy service to sell, he says, because many clients simply don’t have the time to keep up with watering. He calls the service a “protection of their investment.” While Level Green offers warranties on the plants it installs, the warranties are contingent on clients keeping up with irrigation.